How to display the flipping effect on mobile devices? 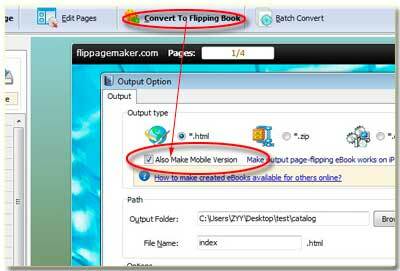 Some people send email to me to inquire how to make flipping effect on mobile devices because they always feel confused why the flipping book can be normally displayed on PC’s browser but mobile (iPhone, iPad and Android-powered devices). Obviously, we design special templates for mobile viewing, so you have to setup it before producing a mobile version. There are 2 options for you to choose, one is slide, and another is single flip. You might notice the adjective word single which initially show single page rather than two page (shown on PC browser) flipping on mobile devices’ screen. Let’s learn how to setup single flipping effect for mobile viewing. Step1: Start FlipBook Creator (Pro), and then import a PDF in and then edit it to achieve a decent look. Step2: on the top menu, there is an option name Option, click it to open more options, select Application Option. 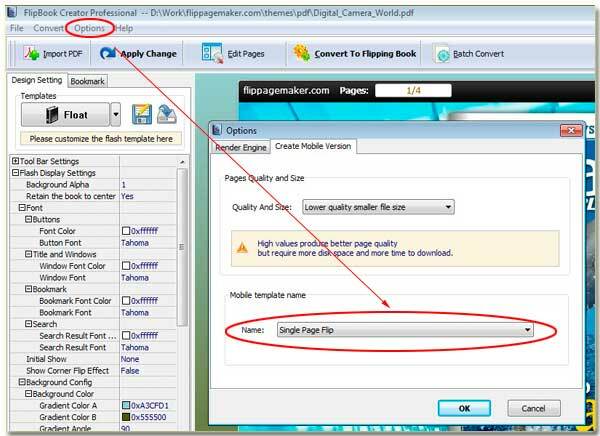 Step3: open the option of Create Mobile Version, on the below area of Mobile template name, click the name selection widow choose the single page flip mode. Note: when you go to the last step of building flipbook, it is very important to check the checkbox of Also Make mobile version….